As a single raindrop falls to the ground, it can splash back up in a crown-like sheet, spraying smaller droplets from its rim before sinking back to the surface—all in the blink of an eye. Now researchers at MIT have found a way to track the thickness of a droplet's rim as it splashes up from a variety of surfaces. This incredibly specific measurement, they say, is key to predicting the number, size, and speed of smaller droplets that can be ejected from the rim, into the air. Lydia Bourouiba, assistant professor of civil and environmental engineering and director of the Fluid Dynamics of Disease Transmission Laboratory at MIT, says the group's results can be used to model the physics of sprays, such as pesticides that splash back up from crop leaves, or raindrops that may pick up and spread diseases as they bounce off contaminated surfaces. "Our fundamental investigation aims to understand spray physics, and identify the key ingredients that control sprays, whether one wants to minimize secondary droplets that are undesirable, or improve sprays to homogenously coat a surface, " Bourouiba says. "To do all that, one needs to know how the fluid breaks up." Bourouiba and her students have published their results in the journal Physical Review Letters. Her co-authors are graduate students Yongji Wang, Raj Dandekar, Nicole Bustos, and Stephane Poulain. For the past several years, Bourouiba's group has been developing image-analysis algorithms to automatically extract and measure certain features in high-speed videos of fluid breakup processes. State-of-the-art high-speed cameras can for the most part capture, in slow motion, the evolution of a splashing droplet—a process that takes about several milliseconds, during which time, thousands of smaller droplets may be ejected into the air. Scientists have used such high-speed videos to measure the size of ejected droplets, the thickness of the expanding rim, and other splash features, largely by hand. "Because all these features change constantly over a short period of time, extracting high-accuracy, unbiased measurements in the data is quite tricky," Bourouiba says. "Classical algorithms are unable to capture all of these details." In contrast, her team's algorithms can automatically discern a splashing droplet's rim and distinguish it from the smaller droplets that spray out from the rim, and the ligaments that form around the rim. Once the algorithms have processed the image data, the researchers can clearly separate the rim from the rest of the droplet's features, and extract its size, at any instant during the splashing process. The team set up multiple experiments to see whether they could detect a common trend in the way a droplet's rim evolves as it splashes onto a surface. The researchers tested about 15 liquids of varying viscosity and viscoelasticity, or stringiness. They released single drops of each liquid from a high-precision "drop tower," a setup that can manipulate very precisely the size of the droplet released, the orientation of the surface below, and the lighting conditions in which to record the droplet using high-speed cameras. The team released each droplet onto different surfaces, including a pool of water, the edge of a surface, surfaces of different roughnesses, surfaces coated with a thin liquid film, and small surfaces of comparable size to that of the drop, namely rods. After they fine-tuned the algorithms to automatically analyze each droplet video, they began to notice a pattern in the way a droplet's rim evolved over time. The rim is typically not smooth, but shows ripples and bulges. The researchers showed that the instantaneous generation of these ripples along the rim is independent of acceleration and is instead primarily determined by the geometry of the rim. However, the rim's thickness is related to the acceleration of the rim as it expands into the air. The greater the rim acceleration, the thinner the rim, and the more fast-moving droplets detach as it expands. In other words, it is the rim's acceleration that determines how much fluid remains in the rim and how much fluid is pushed out of the rim into the air, ultimately in the form of droplets. "It's like when one is in a car that suddenly decelerates," Bourouiba says. "The deceleration of the car's reference frame introduces a fictitious force that pushes one forward. It's the same as what a fluid volume feels when the entire sheet decelerates." A key insight the researchers had is that the change of acceleration over time matters. If a ripple grows more than its neighbors to become a bulge, the instantaneous virtual force it feels given the instantaneous deceleration ends up pushing it forward more than its neighbors, resulting in its elongation and ultimate detachment in the form of a droplet. 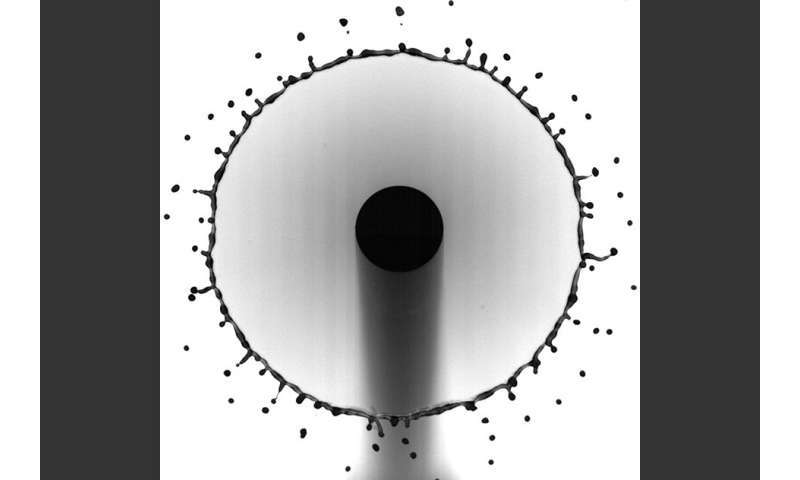 From their experimental observations, the team devised a simple equation to predict the thickness of a droplet's rim given its acceleration, at any point along the rim and at any instant during the splash process. The equation is based on what's known as a Bond number—a nondimensional number that is typically used to compare gravitational forces to inertial forces. "If this number is very big, gravity dominates, such as for a big puddle of water that will flatten because gravity pulls it down," Bourouiba says. "For a tiny drop, it's not flat, but spherical, because surface tension dominates. If the Bond number equals 1, the two forces are in balance." With their new equation, the researchers swapped out gravity for rim instantaneous acceleration, and used the equation to calculate the Bond number—essentially, the ratio between rim's acceleration induced forces and surface tension—at any point along its rim at each time. The higher the Bond number, the more acceleration dominates at a given point along the rim, and the more likely that location will break up and release a smaller droplet into the air. The smaller the Bond number, the more surface tension dominates and acts to keep the rim intact. The team found that for unsteady rims, the Bond number as they defined it, remains equal to one at all times, leading to a very simplified theoretical model of the rim thickness, despite the complexity of this process that changes continuously in time. The team found the theory holds up across a range of viscosities, including liquids as thin as water, and as thick as plasma or milk. It can also predict how the rim evolves as a droplet is splashed onto a variety of surfaces, with different geometries. "The theory is not only universal across [surface] configurations, but can continue holding for a big family of industrial and biological fluids, for example," Bourouiba says. Previously, scientists had only been able to devise a theory to predict a rim's thickness in "steady" configurations, such as a continuous stream of water flowing from a faucet at a constant rate. Such a situation is considered to be steady, as it would produce a sheet of water splashing up from the surface, with a rim size and other properties that wouldn't change over time. "But all impacts of drops, from raindrops, decontamination or pesticide spraying, or other fragmentation processes such as sneezes, are in fact unsteady, an aspect of the problem that has not been tackled in prior work," Bourouiba says. "We showed that this new theory holds for a wide class of problems that are unsteady." "The tiny droplets emitted can transport very far away from the place where the impact takes place, for instance, pathogens, or other types of organisms or molecules," says Jose Manuel Gordillo, professor of fluid mechanics at the University of Seville in Spain. "I believe that these findings will not only help in the basic understanding of unsteady fragmentation of rims in natural proccessess, but also in applications related, for instance, with printing."